Residents of Kazakhstan say they are being prevented from seeing their families after Chinese authorities in the troubled northwestern region of Xinjiang began confiscating the passports of ethnic minority Kazakhs whose family members live across the border, sources told RFA. Meanwhile, members of the Turkic-speaking, mostly Muslim Uyghur ethnic group currently living across the border are being ordered to return to China, according to their relatives living in Kazakhstan. Kazakhs who hold Chinese passports and permanent residence cards for Kazakhstan are also being told to hand in their Kazakhstan-issued residency cards to Chinese police "for safe-keeping," they said. A Kazakh who holds a Chinese passport but who lives in Kazakhstan said that only majority Han Chinese are now being permitted to leave China to visit friends and relatives across the border in Kazakhstan. "Ever since Jan. 1, 2017, the authorities in Xinjiang have been confiscating people's passports, and even their [Kazakh] green cards as well, for so-called safe-keeping," the source, who asked not to be identified, said. "Officials at county level and local police are forcibly taking away people's passports all across [Xinjiang]." He said Kazakh government figures show that the country has seen an influx of around one million immigrants in the past 25 years, including 200,000 ethnic Kazakhs from China who have since taken Kazakh nationality. "There are probably another 300,000 or even maybe 500,000 Kazakhs [who still hold Chinese passports], and the Chinese authorities are confiscating the passports of their relatives back in China," he said. "That means that these people can no longer get together with their families." 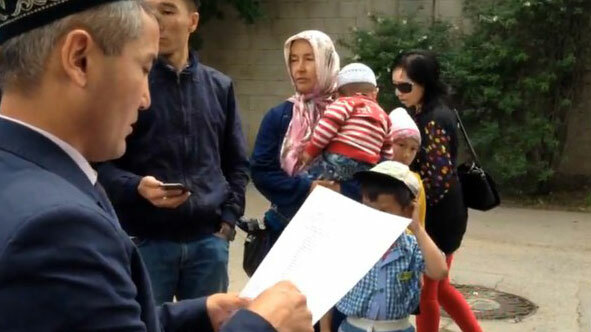 The move prompted a protest by around a dozen people with relatives affected by the measures, who read out a petition outside China's consulate in Almaty on May 31, according to a video sent to RFA. According to the Kazakh-based source, many more Chinese nationals are living temporarily in the country, either for business or to visit friends and relatives. "The Kazakhs in China had all of their sources of income cut off, but these problems didn't affect the Han Chinese," the source said. "It was just no good for ethnic minority groups." He said the exodus of poorer Han Chinese migrants to Kazakhstan continues unrestricted, however. "There are flights from Beijing to Almaty every day, and many of them are filled with raggedly dressed farmers and migrant workers, the poorest people from places like Sichuan," he said. "They all go there on a 20-day tourist visa." An officer who answered the phone at the police department in Shawan county, which lies between Xinjiang's regional capital Urumqi and the Kazakh border, confirmed the policy when contacted by RFA on Tuesday. But he denied it was only being implemented for ethnic minorities. "Yes, they had to turn them in according to the last [directive]," the officers said. Asked if the policy also applied to Han Chinese, he said: "They all have to hand [their passports] in: everybody does." A directive issued by the Koktokay (in Chinese, Fuyun) county government in Xinjiang's Altay prefecture orders onApril 12, 2017 makes a similar demand on local residents, around 70 percent of whom are Kazakh. "Anyone with a passport must hand it in to ... within three days," the notice, a copy of which was sent to RFA, said. "This is a unified review across the district. When the review is complete, the passports will be released." "Anyone not handing in their passport must face the consequences." While the new rules are ostensibly universal, restrictions on passports have targeted ethnic minority groups in the past, making it harder for Uyghurs to book overseas vacations or go on the annual Hajj pilgrimage to Mecca, regional sources have told RFA. But far more stringent rules are applied in ethnic minority regions where opposition to Chinese rule is strong, and where the authorities fear instability. Beijing regularly accuses what it says are exiled separatist groups, such as the East Turkestan Islamic Movement, of being behind the violence in Xinjiang. Exile Uyghur groups have said the rules are designed to target Uyghurs, who have been portrayed by Beijing as potential terrorists after a wave of violent incidents hit the region following a crackdown on an initially peaceful protest in the regional capital, Urumqi, in July 2009. But local media last year reported similar measures targeting Kazakh residents of a Xinjiang border district, who are now required to give DNA samples, fingerprints, voiceprints and a "three-dimensional image" in order to apply for certain travel documents, including passports.